Nehemiah was a great servant of God who feared God's Name (Neh 1:11). After 70 years of Babylonian captivity, Nehemiah returned to Jerusalem and remained there for 12 years to help build up God's people. Nehemiah 9 is probably one of the longest recorded prayer in the Bible. Here, the Levites led the Israelites in prayer. 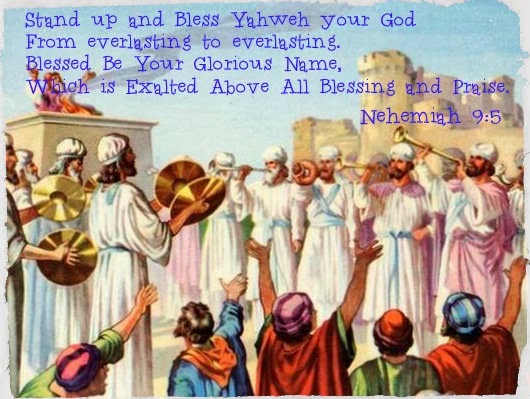 Right at the beginning of their prayers, they blessed the glorious Name of Yahweh. When the Levites gathered the people to prayer, the first thing they said to the people was: "Stand up and praise YAHWEH God, FOREVER and EVER." This event tells us something very SIGNIFICANT: Even after 70 years in Babylonian captivity, the Name of God, Yahweh was never forgotten. Please take note that the Levites led the congregation to praise YAHWEH and bless the glorious Name of God. They knew God as YAHWEH and called on YAHWEH. Secondly, the Levites also instilled on the hearts of the Israelites that God's Name, Yahweh, must be praised and blessed FOREVER and EVER. They remembered the teaching of Moses back in Exodus where God says: "This Is My Name FOREVER." So now, after 70 long years away from Jerusalem, the new generation of Levites reminded the people again that Yahweh's Name be blessed FOREVER and EVER. The Israelites needed to teach their children to bless and praise Yahweh God from generation to generation. Isn't this interesting? In the past, we were given the impression that the Israelites did not use God's Name, Yahweh anymore after the exile. This is simply not true. Actually in the books of Ezra and Nehemiah, the Levites continued to teach God's people to call on Yahweh Name as this is God's Name FOREVER and EVER.